The public meetings begin on Wednesday night for a planned segment of the Gold Line that would run from Azusa to Montclair in the San Gabriel Valley. Details are after the jump. 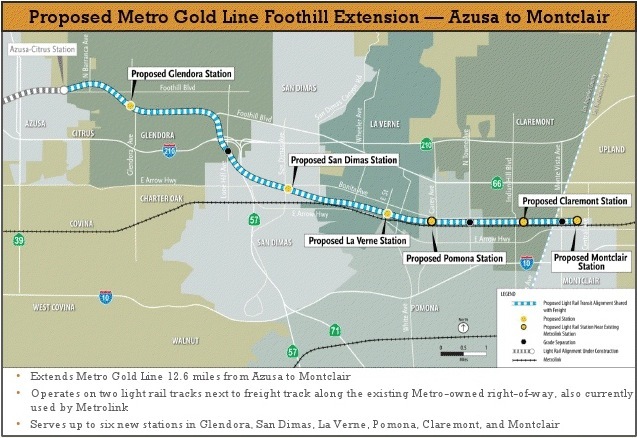 The Gold Line Foothill Extension Construction Authority — an independent agency from Metro — has said it will begin construction of the Pasadena-to-Azusa segment of the line this year. That segment is funded by Measure R, the sales tax increase approved by county voters in 2008. The segment from Azusa to Montclair is listed in the first tier of “strategic unfunded” projects in Metro’s long-range plan. Each meeting will start with a project presentation, opportunity for Q&A , and then open house format where stakeholders can talk one on one with the project team and provide feedback on the project or scope of the environmental review. In addition to the public scoping meetings, we will also be hosting an interagency scoping meeting for public agency staff on Thursday, January 13, 2011 from 2 – 4 p.m. at the Timothy Daniel Crowther Teen and Family Center in Glendora. I encourage you to attend any of these meetings and also review the attached materials, which include the Notice of Intent, corridor map and information boards to be utilized at the meetings. Additional information is provided on our website – foothillextension.org. I can think of 50 places in L.A. that can demonstrate a more compelling need for a new rail line. What a sad misallocation of hundreds of millions of dollars. I am disabled and I live in Ontario and must take 3 buses to get to Claremont to see my doctor. The 14 mile trip takes me well over 2 hours by bus and can be much longer if buses are not on schedule and a connection is missed. It seems absurd that there is no better route. A train line linking Ontario Airport to the Claremont Metrolink Station would be a Gosend for me and for all of the communters who must drive or bus to work from Ontario.